The time has come for me to say my last words from this high podium, from this desk, at which I have had the great honour of sitting from time to time over these last eight years. I am accordingly given the privilege of now expressing some words of gratitude to a few people, whom I assure you merit great praise for the manner in which they have, during the 71st session, served the best interests of the General Assembly of the United Nations. First and foremost, I give thanks and highest praise to Secretary-General Antonio Guterres, who from the time of his swearing in on the stage before us, has given his very all to protect the well-being and formidable aspirations of this our organisation, and indeed, thereby the world. I extend that gratitude to Deputy Secretary-General Amina Mohammed for her resolve in taking up the vital responsibilities of reform and development. To the Vice Presidents of the 71st session and the Chairs of the six committees, your support in managing the work of the Assembly was praiseworthy throughout, and I especially thank the Vice Presidents who took on the burden of Acting PGA on the various occasions when I was overseas. Likewise, the many facilitators, chairs and advisers whom I appointed to lead the various processes mandated by the General Assembly; all of who performed to the highest standards of expectation. I acknowledge with deep gratitude the close collegiality of the President of ECOSOC and the Presidents of the Security Council during the 71st session. To the Chairs of the Regional Groups, we are grateful for the worthy work done on behalf of our five groups. To the Under-Secretary-Generals and the Secretariat, especially Under-Secretary-General Pollard and the erstwhile staff of DGACM, my sincere thanks for your being ever dependable and always ready to assist the Presidency and the membership. I thank Member States and the Permanent Missions for your encouragement and advocacy during the 71st session. In terms of communal effort, it was a year of which we can all be proud. I especially thank the Member States that contributed financially or through staff secondments, to the Office of the President of the General Assembly. Every dollar received was deposited directly into the United Nations Trust Fund. To each and every one of the staff of the OPGA, so ably led by Chef de Cabinet Tomas Anker Christensen, I bow to your dedication to the work of the United Nations and your brilliant endeavours during the 71st session. Final words of deepest gratitude are given to the Government of Fiji for supporting my term as President of the General Assembly, to all Fijians who serve and have served in the light blue berets and helmets of UN Peacekeeping, and to Ambassador Luke Daunivalu and the staff of the Permanent Mission of Fiji for their ever reliable reinforcement of my work. I began my career with the Government of Fiji as a District Officer in Navua in 1972 and this 71st session has been an extraordinary opportunity to round off that service. Vinaka vaka levu. They say a speech should have a beginning, a middle bit, and an ending. For the middle bit of this speech, I will now give a brief recount of some of the highlights of the 71st session. Many of you recall the day I stood at the rostrum and took an oath of office, committing to conduct my duties in ‘all loyalty, discretion and conscience’. I was the first President to take the prescribed Oath and you will hear it taken once more this afternoon when President-elect H.E. Miroslav Lajčák stands before you. Both the Oath of Office, and the Code of Ethics to which it refers, are now displayed prominently at the entrance to the President’s Office. In addition, I was the first President to participate in the UN’s Financial Disclosure Programme and the first to rely solely on the UN regular budget allocation and contributions to the OPGA Trust Fund to run the office. I trust this will be judged as a continuation of the culture of transparency advanced by my predecessor President Lykketoft. It was a sign of the great trust the membership places in the Office of the President, that the transition from Secretary-General Ban Ki-moon to Secretary-General Antonio Guterres was accomplished so smoothly. Following on from the unprecedented openness and inclusivity by which Secretary-General Guterres was selected, and the Security Council’s decisive and unanimous decision, the transitional ceremonials of paying tribute to the outgoing Secretary-General and swearing in of the ninth Secretary-General were concluded in a manner that strengthened the authority of both this Assembly and the incoming Secretary-General. Last September’s High Level Meeting in the General Assembly included the adoption of the New York Declaration for Refugees and Migrants, laying the ground for a more humane and coordinated approach to the challenges facing both refugees and migrants. The plight of the world’s displaced, which remains at the highest levels in decades, continues to demand sustained engagement and a more effective global response. In a similar vein, in just two weeks’ time, the Assembly will address how better to combat the scourge of trafficking in persons. Following extensive consultations, the agreed draft Declaration for that High Level Meeting has been forwarded to the 72nd Session. Last December, the General Assembly fulfilled its role under the UN Charter following deadlock in the Security Council on the situation in Syria, adopting a resolution establishing a mechanism to facilitate the investigation of serious crimes committed in that country since 2011. In May, the first step towards reforming the UN Secretariat under Secretary-General Guterres was taken. The Assembly adopted the resolution creating the United Nations Counter-Terrorism Office, aimed at enhancing the Organization’s capability to assist Member States in implementing the UN Global Counter Terrorism Strategy. In June, the Fifth Committee asserted the Assembly’s duty to those risking their lives in the UN’s peacekeeping missions in the world’s trouble spots, with Member States reaching an important compromise on the financing of these missions. On 7 July, a General Assembly mandated Conference adopted the first ever Treaty banning nuclear weapons – a step forward which many Member States hope will inspire progress in other multilateral disarmament fora. Through the Ad Hoc Working Group on the Revitalization of the General Assembly important provisions were adopted in the 71st session, relating to the alignment of the GA Agenda with the 2030 Agenda, the UN Journal, the role of the General Committee and engagement with the UN Secretariat. Reform of the Security Council has been thoroughly debated in the course of the Intergovernmental Negotiations process established by Member States. It is clear that those negotiations will require a greater degree of flexibility of positions if they are going to result in actual reforms. In the end it must be the willingness of Member States to explore convergences and commonalities that will result in the reforms we seek. As you know, the main effort of the 71st Session was directed at achieving momentum in the implementation of the 17 Sustainable Development Goals. Last Friday, I provided a comprehensive report on this subject to the General Assembly highlighting the advocacy and awareness raising efforts undertaken by my Office. In the global efforts made in this effort, I particularly thanked Ms Dessima Williams of my Office and PGA Special Envoy on SDG Implementation and Climate Change, Ambassador Macharia Kamau of Kenya. During Friday’s interactive discussion with Member States and panellists, we discussed he outcomes of the five signature SDG action events convened during the 71st session, namely on Sustainable Peace; on Climate Change; SDG Financing; Innovation & Connectivity; and on Education. On Friday, I drew attention to the many GA mandates fulfilled this session ranging from GA meetings on Anti-microbial resistance, the New Urban Agenda, Water-related Goals and targets, and World Wildlife Day, to GA decisions relating to the QCPR, the Global Indicator Framework, the Technology Bank for LDCs, and South-South Cooperation. The jewel in the crown of the 71st session was The Ocean Conference, which attracted the attendance of the best of international expertise and Ocean interests, and raised global consciousness in support of the targets of SDG14. The conference produced ‘A Call for Action’ document, subsequently adopted by the GA, setting out the need for urgent action to reverse the cycle of decline into which the Ocean has been caught by accumulated human activity. A new community of actors was mobilized by the conference to support SDG14 implementation and almost 1400 voluntary commitments were received to begin work on restoring our relationship with the Ocean to one of sustainability, respect and balance. From the experience of the 71st session, I draw a number of key conclusions. First, I believe that together we have succeeded in generating momentum right across the SDGs and that the outlook for SDG Implementation is positive. Second, while progress is being made in some key areas, progress on individual SDGs on the ground is uneven, across regions, between the sexes, and among people of different ages, wealth and locales, including urban and rural dwellers. Third, the gaps in SDG awareness across the world remain far too high, which we must correct if the people of this world are to embrace the transformations of systems and behaviors required for a sustainable way of life on this planet. Fourth, major gaps exist also in the UN system’s capacities and abilities to effectively and coherently support Member States on SDG implementation, as indicated in the Secretary-General’s July report. I strongly encourage Member States to support the Secretary-General in addressing these gaps and in advancing these and other reforms over the coming period. Fifth, The Ocean Conference demonstrated the power of bringing together a wide-range of actors to respond to SDG implementation. Partnerships and collaboration will be key to the success of the SDGs and a more systematic approach is needed towards facilitation of this collaboration. Sixth, a major shift is required in the area of financing – a shift towards aligning the financial system away from unsustainable investments towards the SDGs. A surge of private investment in developing countries is required, particularly in areas such as energy and infrastructure. We must see a significant increase in development assistance; a dramatic improvement in global tax cooperation; and a review of global trade and other economic policies to align them with the SDG’s focus on inclusion and sustainability. Again, the UN has a critical role to play in this area, bringing key partners together and advocating for effective action. And lastly, we must embrace the power of innovation and technology to leverage SDG implementation and combat climate change at the speed and scale required. I cannot underline this message strongly enough. We are witnessing exponential change in multiple areas of technology and we must manage the risks and seize the opportunities for the common good of humanity and the planet. And thus we get to the ‘ending bit’ of this statement. 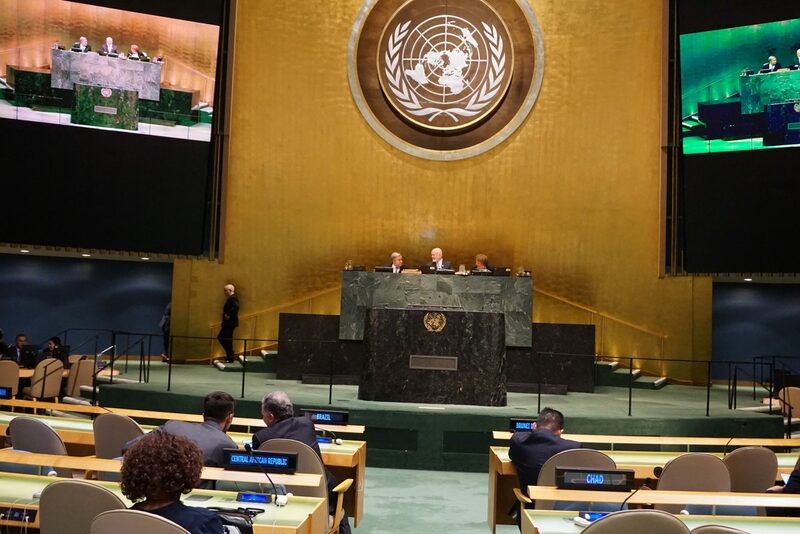 The 72nd Session – focusing on people, striving for peace and a decent life on a sustainable planet – holds much promise with the Secretary-General’s reforms underway and the High Level Meeting on Sustaining Peace coming up. In keeping with what is now established practice, it has been a pleasure to provide support to President-elect H.E. Miroslav Lajčák, including by preparing a comprehensive handover report summarizing the work done by my Office during the 71st session. Having got to know him over the past six months, I am happy to say to you all that the President of the 72nd Session in a man of excellent character, rich experience and firm commitment to the purposes and principles of the UN Charter. The gavel will be in safe hands come tomorrow morning. I finish the 71st Session the way I started it, in full conviction that the only way we can safeguard the future of our grandchildren on Planet Earth is by faithful implementation of the Paris Climate Agreement and the 2030 Agenda for Sustainable Development. Implementation is well within our grasp: we have the masterplan, we have universality and inclusivity of purpose, we certainly have the resources, and we have definitely got the ingenuity to get there. As I said at the Friday briefing, we have not come this far as a species only to be defeated by greed. But let us never forget that there are great responsibilities that come with the Agenda: responsibilities for sustainable consumption and production; for equity between and within countries, between gender, races and age groups; for commitment to investment in infrastructure, services, industries and decent employment; for embedding the principle of sustainability into everything we do – no growth or development brings good for us, if in the end it detracts from the sustainability of our way of life on this planet. The Agenda calls on us to conserve and sustainably manage the ecosystem in which we live, terrestrial, oceanic and climatic. We are stealing from our grandchildren’s future if we continue to take more from the planetary ecosystem than it can sustainably grant. This is the truth within which all other aspects of the Agenda exists, we live within the fundament, the Ocean, the Climate, the air we breathe unite us. For my part, as I now bid this great Assembly adieu; after my departure on leave tomorrow, I intend dedicating my working days to Ocean action, to continue in the dogged pursuit of the targets of SDG14, that we might arrive at the year 2030 with an Ocean restored to sustainable health. I hope to join with many of you dear colleagues in making that so. Good luck with your preparations for the forthcoming High-Level week, look after our Secretary-General and PGA72, and may your hands be strong for the momentous tasks awaiting you in the 72nd Session. It has been a mighty privilege to have been of service to you all from this high podium.